The Gateway to Rodeo Drive. 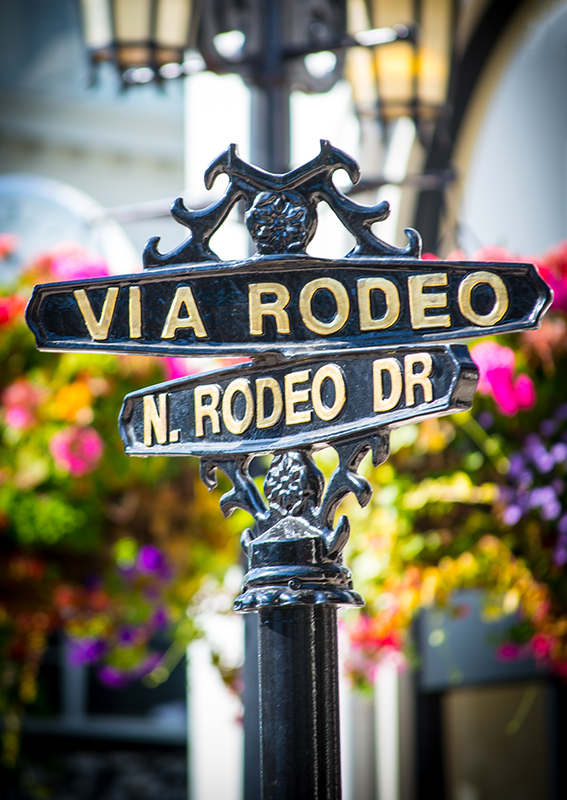 Brimming with European charm and bustling with life, Two Rodeo is the crown jewel in the bright, glittering heart of Beverly Hills’ world-renowned designer shopping district. Two Rodeo features an exquisitely eclectic ensemble of restaurants and shops that meets your every need — from distinctive dining and nonpareil pampering to luxury lifewares and hip, haute fashion. Home to diverse designer luxury brands such as Versace, Lanvin, Tiffany & Co. and Jimmy Choo, Two Rodeo is constantly experiencing transformation. Two Rodeo designer boutiques are open seven days a week. Two Rodeo. One of a kind. Head S.E. on World Way toward West Way and take a slight right. Turn left to merge onto I-405 N. toward Santa Monica. Take the Wilshire Blvd. E. exit and keep right at the fork. Follow signs for Wilshire Blvd. E/Westwood and merge onto Wilshire Blvd. Take slight left onto Dayton Way and Two Rodeo will be on your right. Valet parking at 9480 Dayton Way, Beverly Hills, CA 90210. Follow signs for Santa Monica Fwy/I-10 W. and keep left to merge onto I-10 W.
Take the Robertson Blvd. exit and turn right onto S. Robertson Blvd. Take the 1st left onto Cattaraugus Ave. and turn right onto Castle Heights Ave. Turn right onto Beverwil Dr. and turn left onto W. Olympic Blvd. Take the 2nd right onto S. Rodeo Drive and turn right onto Dayton Way. Two Rodeo will be on your right. Valet parking at 9480 Dayton Way, Beverly Hills, CA 90210. Take I-5 N. to Pamona Freeway exit toward I-10 W.
Merge onto CA-60 W. and merge again to I-10 W.
Keep left at the fork and merge onto I-10 W.
Take the Venice Blvd. exit toward La Cienega Blvd. Turn right onto La Cienega Blvd. Stay on La Cienega Blvd., turn left on Wilshire Blvd. Turn right onto Via Rodeo Drive, turn right onto Dayton Way. Two Rodeo will be on your right, valet parking at 9480 Dayton Way, Beverly Hills, CA 90210. Head N.W. on Airport and continue straight to stay on Airport. Turn right onto W. Empire Ave., turn left onto Clybourn Ave. Turn right onto Vanowen St., turn left onto Vineland Ave. Turn right to merge onto US-101 S. toward Los Angeles, take the exit toward Vine St. Turn right onto Vine St., turn right onto Santa Monica Blvd. Turn left onto N. Rodeo Drive, turn left onto Dayton Way. Take I-10 E. and take the exit onto I-405 N. toward Sacramento. Follow signs for Wilshire Blvd. E./Westwood and merge onto Wilshire Blvd. The first 2 hours are free from 7:00 AM – 6:00 PM. Each additional 15 minutes after is $2.50, with a maximum fee of $17.50. Early Bird Fee: Arrive from 7:00 AM – 8:30 AM and receive an all-day parking flat rate of $7.00. Arrive from 6:00 PM – 9:00 PM and receive a flat rate of $7.00. Reserved and unreserved parking is currently available. For monthly parking rates and any other questions, please contact the Parking office at 310-247-7057. Whether you’re shooting still photography or the next big blockbuster, Two Rodeo is a versatile film friendly Beverly Hills filming location for your high end, upscale or open air filming needs. The cobblestone Via is brimming with European charm and the retail storefronts range from classic to cutting-edge current. Two Rodeo’s recent credits include Showtime’s “House of Lies”, MTV’s “House of Style”, History Channel’s “America’s Secret Slang”, an M&M Commercial for the Superbowl, as well as countless editorial photo shoots.